If your daughters have chosen to play coed-mixed lacrosse which is allowed up till U11, then the girls are required to be outfitted with the complete Boys Protective gear. Follow the link to the Boys Required Equipment page. 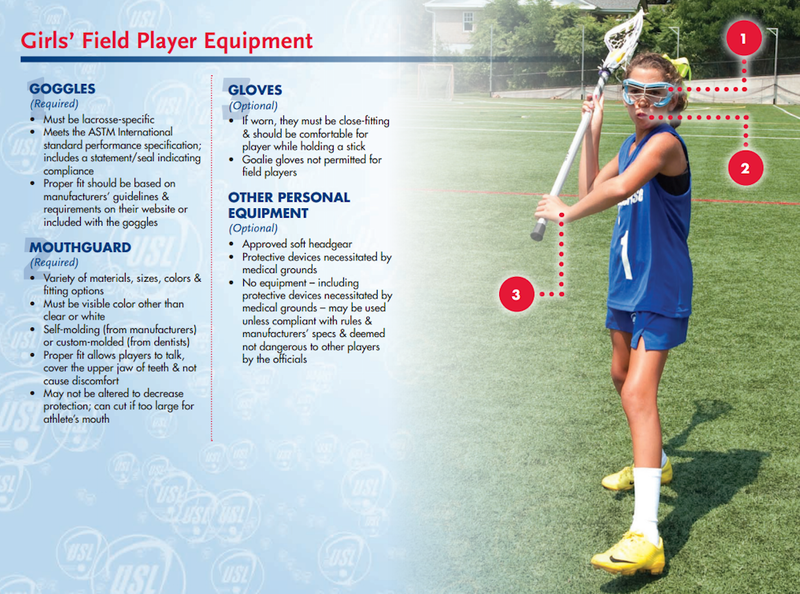 Download the US Lacrosse Equipment Fitting pamphlet to take with you to the retailers. A regulation youth lacrosse stick is made up of a head and a shaft which varies with regulations dependent on age group. Approved lacrosse goggles, visit the US Lacrosse Goggle web page for details. Girl's Lacrosse Gloves are optional, please do not use boy's lacrosse gloves.